“My name is Harriet Manners, and I am a model. Its monday morning, and I’m wearing a gold tutu, a gold jacket, gold ballet pumps and gold earrings. My face is painted gold, and a long piece of gold wire has been wrapped around my head. This is not how I normally dress on Mondays. I have a bodyguard. The earrings cost so much I’m not allowed to go to the toilet without a large man checking my earlobes afterwards to make sure I haven’t accidentally flushed them. I haven’t been allowed to smile for two hours. Harriet is back, and this time she’s hitting the streets of Tokyo, alone. When she gets offered the chance to be a part of something huge Harriet knows she wants to be there, the streets are fast paced and life is crazy in this part of the world so she’s glad her grandmother is there to accompany her – until her grandmother kicks her out and she’s faced with a model flat with two girls who, whilst lovely, are a bit much and she discovers that everything she thought she knew about boys was all made up. Right now she would give up every fact and piece of knowledge in her head just to grasp the faintest clue about what to do next. So obviously I LOVED Geek Girl and I knew I wanted to read Model Misfit as soon as it came out. Its taken me a little while but thankfully its finally been added to the read pile and I am so glad it did not disappoint. As hilariously funny as the first book Model Misfit throws some curve balls that you don’t expect to come whilst Harriet struggles not to be fired for, well; being Harriet. The story is brilliant. It takes place a few months after the first book and there’s been some smooching with Nick AKA Lion Boy, a lot of being followed by Toby, loads of hanging around with Nat and Annabel is like a beached whale waiting to drop out a little brother or sister. Things were pretty crazy for Harriet and unfortunately when Nick dumps her things get worse. The end of exams are near and to take her mind off him she plans an epic summer of awesome with Nat only to find that Nat is going to France for most of it. Then the Tokyo offer comes in and Harriet is on the first plane out there – only to come face to face with Nick and his new girlfriend. Madness follows. The Geek Girl series is so much fun because whilst some of the things that happen seem outlandish and too good/bad to be true, Harriet is a real, true to life character and there is a lot about her that a reader can relate to. I definitely relate to her awkwardness, her nerves and her love of dinosaur t-shirts, and I am sure there is a lot other teens will relate to as well. It doesn’t matter that the reader is never going to be whizzed off to Tokyo or Russia because Harriet is the the same person there as she would be at home. A lot of things go on in Model Misfit and obviously I don’t want to ruin anything for anyone who hasn’t read it but I absolutely loved what it said about families, friends and the people you can trust. I loved that it had adults admitting they were wrong and kids setting things right after going off on one. There were misunderstandings and it had a lot of bitchiness floating about but it was keen to remind us that sometimes when we think we are right, other things are going on with other people and we should still clarify what their feelings are before going mad. Harriet dives in head first without checking the facts an awful lot and whilst that is her way, she always makes sure she fixes things after, thats why I love her. The Geek Girl series has been a real hit and the third book promises more than the first and second, but I reckon Holly Smale can definitely pull it off. Its one that will appeal to the girls who love fashion and make up and who wannabe models but it will also apply to the average teen who just wants to be herself and the geek who finds it hard to shut up at inappropriate moments (ie me!) I definitely recommend the series and that you check out Holly’s appearances at book festivals and signings because apparently she is an awesome speaker. 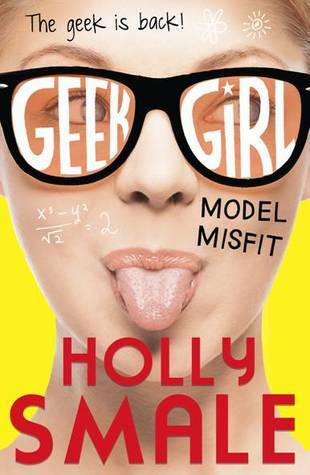 Geek Girl: Model Misfit was published by HarperCollins in September 2013 and the third book, Picture Perfect, is due for release this summer. My copy was loaned to me from a friend.